Feel the tranquility, touch the elegance and experience exceptional service. Enjoying a truly unique and stunning cliff-top location in Portugal, Cascade Wellness & Lifestyle Resort is one of the most luxurious 5 star hotels in the Algarve, offering an elegant and sophisticated experience in the historic city of Lagos. With a contemporary and modern atmosphere, the hotel is divided into four wings, each reflecting the expeditions of Portuguese navigators across four continents (Europe, Africa, Asia and South America), which is reflected in the tasteful décor of the rooms and suites. All are very spacious and feature balconies or terraces. Families may also enjoy all the privacy and functionality of the apartments or even a luxury holiday villa with a swimming pool. At the hotel, a passionate and hospitable team will receive and take the best care of you with an impeccable service. You’ll have access to special health programmes combining fitness with detox menus and lifestyle healthy cocktails, as well as to the Tainai SPA, a true oasis of tranquility based on the “sound mind sound body” philosophy. 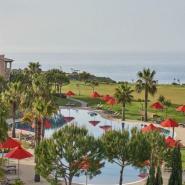 During your stay, we suggest taking a refreshing dip on the splendid swimming pools, one of which with a natural sand bottom, sampling a world-class culinary experience with our restaurants Moods and Senses, offering all-day-dining and a-la-carte options, and also improving your swing at the driving range. The Cascade Wellness & Lifestyle Resort is a unique holiday destination, located within walking distance to Dona Ana Beach, distinguished by Condé Nast Traveller as one of the 50 best beaches in the world, and to the Ponta da Piedade lighthouse, where you can enjoy breathtaking views of the Algarve coastline and the Atlantic ocean. Take the A2 highway to the Algarve. At the end of the highway, exit towards Lagos / Portimão / Albufeira (exit 15). This exit will take you directly to highway A22. Continue along this highway and exit towards Lagos / Vila do Bispo (exit 1). Follow this road and keep going straight after the first roundabout. At the second roundabout, turn left towards the city of Lagos. You will find a gas station on your left and after around 300 meters you will find another roundabout, where you should exit right (following the indication “trânsito local”). Follow this road and continue going straight through 4 additional roundabouts. At the last roundabout, keep going straight and you will see the hotel entrance at the end of the road. If you decide to rent a car, exit Faro airport and drive towards Albufeira / Portimão until you find the sign showing A22 - Albufeira / Portimão. Continue for 80 km and exit towards Lagos / Vila do Bispo (exit 1). After this point, please follow the directions stated above. You should call for a taxi to take you to the Cascade Wellness & Lifestyle Resort in Lagos. If you travel on the Alfa or Intercities service train, with Lisbon or Porto as the point of origin, you should exit in Tunes and change for the regional train towards Lagos. From here, you should call for a taxi to take you to the hotel. The Hotel is closed from 20/11/2016 to 01/01/2017.